Plochmann Lane: The Band's very last live performance together. The Band's very last live performance together. Rick Danko played The Roxy in LA on the 1st March 1978. It was called "The Picnic in LA" and it was a Rick Danko band show, part of the tour. 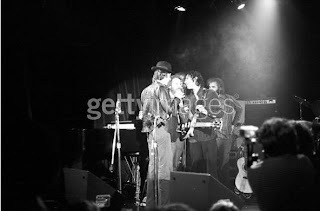 Because it was in LA, Levon, Richard and Garth sat in and Robbie came on stage for a couple of numbers. The photos below documents the event, which was the last time the original quintet played together. The other musicians seen in the photos are guitarist Michael DeTemple and sax player Jerry Peterson. Checkout Jan's site for the rest of these photos he has posted. R. I. P. folk legend Odetta.